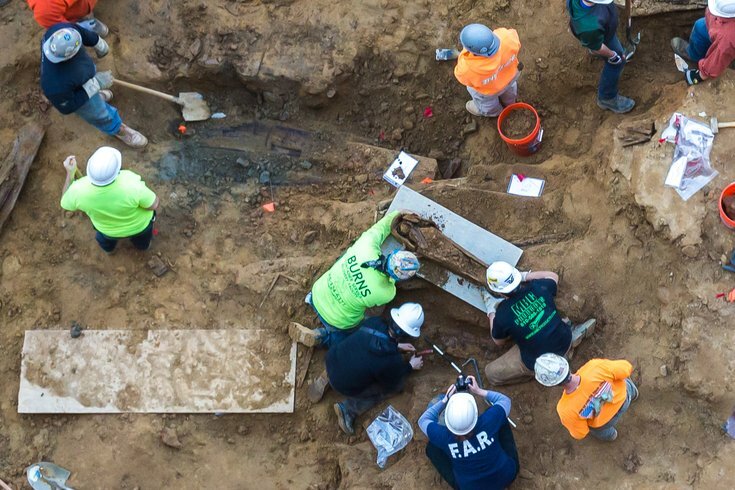 Coffins were found at a construction site on Arch Street, between 2nd and 3rd streets, in Old City. 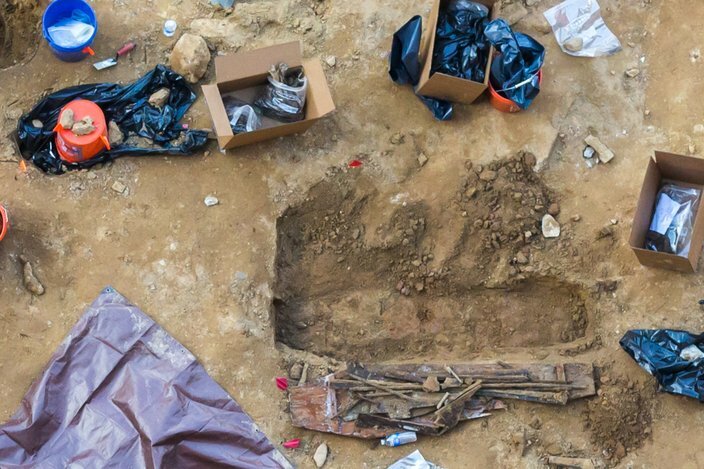 That human remains were discovered at an Old City construction site on Thursday wasn't all that shocking, considering bones had been found there back in September. 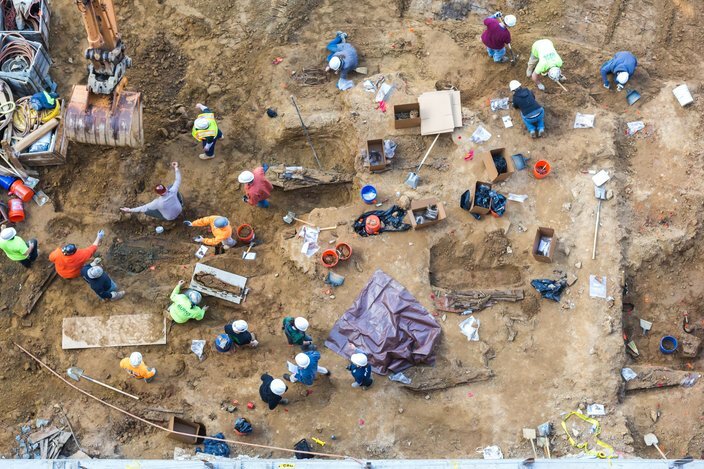 What had construction workers hanging screens around the fences — and throwing a rock at a reporter filming the scene — was the unearthing of some 30 coffins with ties to the former First Baptist Church Burial Ground as work continued on the 218 Arch Street site. The discovery was made Thursday afternoon not far from the Betsy Ross House on Arch Street between Second and Third streets. Archeologists on-site traced the remains back to the mid-1700s, noting they were to have been removed in 1860. "This is not something we were expecting to find," said Kimberlee Moran, a forensics expert with Rutgers University-Camden. Moran noted that soil quality throughout the site impacted the coffins and remains discovered. In sections of the site with clay-like soil, the coffins were preserved rather well. In other areas, with sandy and acidic soil, more erosion was evident. "We're trying to get them out as quickly as possible," she said, adding that, in some cases, pieces of coffin and bones had to be individually removed by hand. "Work has stopped in the area where we know there's remains." From an archaeological perspective, they'd like to have more time to examine the site, but ongoing development of the site has them facing a chronological crunch. "We'd love to do an archaeological excavation, but we have to be realistic," she said. "We could easily be here for months, but we're doing the best we can." Moran was joined at the site by Anna Dhody, curator of the Mutter Museum in Center City. Fielding questions from the media that had assembled at the site, both said they would work to identify the deceased people whose remains were discovered and, if possible, contact living relatives. "We'll do a quick job, but the best job possible under the constraints that we have," Dhody said. They noted that the remains will soon be re-interred at the historic Mt. Moriah Cemetery in Southwest Philadelphia, where other remains were taken after the burial ground was shuttered. They also expect that more remains will be found at the site. While capturing footage of crews at the site, one construction worker hurled a dirt-covered rock that struck me in the chest. You can watch the encounter, which will soon be part of a police report, below. Disclaimer: The video contains some obscene language. This story is developing, details to follow.